You’re phrasing it like it’s a zero sum game. Is the point that creation and distribution don’t create jobs, but production does? I’m not really arguing, I just don’t see how the value added figures fit your case as I understand it. The value added data undercounts imports and overcounts value-added. I’ve written many times about this. Good point, but I think it is possible to go deeper with the Apple example: the production process is composed of assembly (putting everything on a board / case) and hi-tec manufacturing (making the chips / lcd). I believe that what you want to bring to the US is the hi-tec parts; the assembly can be taken care 100m south of the US border. I’m not sure why you want to divide up creation and production and if that really makes sense. Apple doesn’t manufacture their devices but they write, ie “produce,” all their own software and employ around 50 thousand people in total, many producing software. That’s because software is where all the profits are. Admittedly highly successful software companies like Apple, Google, and Microsoft may not employ as many people as a services giant like IBM, but I’ve written before that I think we’re on the verge of a great boom in other information jobs. This guy now pulls in seven figures off of his podcast and associated revenue, like live shows and merchandise. A recession happens when we figure out how to make the stuff we already use really efficiently, such as computer hardware or cars, but we still haven’t figured out what the next thing we’re going to do is nor completely how to make it work yet, ie all the information jobs over the horizon. But we have some smart people working on it and we just need time to figure it out. It will happen, just like it always has, 🙂 but going back to antiquated manufacturing jobs accomplishes nothing. btw, the great thing about the blog format is you can devote as much space as you want for any topic. I think the main issue is not padding out a post just to fill space, like many articles and books currently do, not restricting yourself when you really have something to say. 33 pages is too long. Yeah, 33 pages is, but I’m sure you could have cut it down to a couple pages for a blog post? btw, what do you think of the new SF Fed paper by Hale and Hobijn that has been getting a lot of attention, including these two recent posts by Mark Perry? Does productivity increase more rapidly in manufacturing or distribution? If manufacturing then you would expect this pattern even in the absence of the shift you describe. 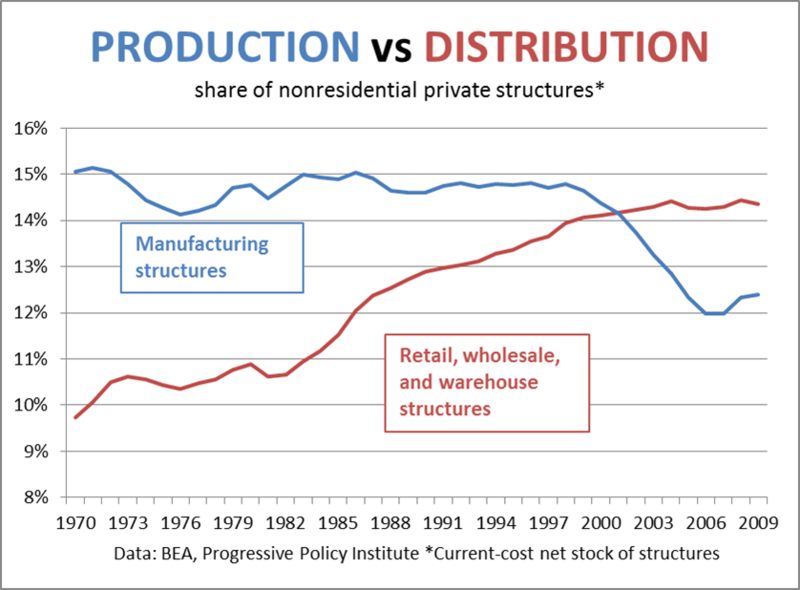 You wouldn’t expect the share of distribution to increase relative to the whole economy. I have to agree with the comment above, Mike. The chart seems to imply our economy consists solely of manufacturing and consumption of manufactured goods, ignoring industries that have no physical product to be manufactured and stored, or retail outlet to sell it in. If we cite Google as an example, they’ve provided thousands of well paying jobs for Americans and bringing more money from overseas back to the US. The same can be said for Facebook, which is generating revenue from businesses worldwide. The issue isn’t whether the US can create more manufacturing jobs, but whether the US can train its workforce for the jobs where it is most competitive. Industries that require high capital investment, an educated workforce, and strong protection of intellectual capital are where the US has a competitive advantage. The issue isn’t to get more people assembling TVs and lawn chairs in the US, but to get more people trained in the fields our strongest industries demand. Dan: Just what are those strongest industries whose demand is not met? A lot of tech companies are offshoring work “because they can”, and there is little evidence of an actual talent shortage. Note, I mean demand for skill sets, not demand for favorable (i.e. low) pay expectations. Much of the hand-wringing over all those positions that cannot be filled is because candidates have “outsized” pay or perks expectations. Some tech employers will admit as much. Sometimes this is couched in terms of “we cannot find the skills” (subtext: at our price point). Meanwhile experienced tech staff or ex-staff over 40 (or whatever the actual magic “too old” marker) as well as most US candidates without “hit the ground running” niche experience are not considered, or are second/third preference at best. What many employers, perhaps with the exception of Google and similar companies in limited growth fields, want is not graduates in the respective field, but graduates with some work experience who are past the “greenhorn” stage. This experience is supposed to come from “somewhere”. I know about some place where people with 3-5 years of applicable postgraduate industry experience are sought, but the larger industry has not been hiring a lot locally over the past decade, and instead “invested” a lot in offshore workforce training (global talent pool and all that). So where are the local 3+ years candidates supposed to come from? There will be some but they will not be interested in pay cuts. What will probably happen is that those jobs are staffed offshore too, or a trained offshore person is brought in on visa. Remember that the culture and hence government have decided to make the US female-centric. Feminists lobbied hard for TARP money to go towards jobs that women do, even if overinvested in already (Healthcare, education), and away from jobs women don’t usually do, even if needed (construction, manufacturing, engineering). Do not overlook this core theme of why the US is a consumption, rather than production, economy. Men have been marginalized in a society-wide campaign to over-privilege women. It is people like you who are the problem, because you don’t want to hold women to the same standards of accountability as men (because you are pathetic and needy). Get a clue. Are you predicting a new recession starting in the next few months? Your words of ‘greatest convulsions in 75 years’ sound ominous, indicating that it is not even just a recession, but worse. Michael, I’m glad that I found your blog. It is always a breath of fresh air to read people who are talking about production and consumption imbalances. The gist of what you seem to be saying is similar in many ways to me what Michael Pettis writes about. If you look at this at a more fundamental level, the question is: What are the problems that we want to solve? Or do we want to solve weightier (and much more lucrative) problems? To do that, we need a production economy. But I think that the concept of a production economy too quickly takes peoples’ thinking to the industrial economy. In the industrial revolution, every aspect of our economy was industrialized. The opportunity today is to create a post-industrial production economy. The design constraints of this economy include minimizing energy use, minimizing/eliminating waste, maximizing health and wellness and maximizing knowledge. In many cases, local development and jobs will also be a priority (not the development of far-off foreign communities but those outside our own doors). We know that we are already shifting to a global knowledge economy. What we haven’t come to terms with is what this shift means to the production economy. It won’t look like the U.S. of the past or even the China of the present. It will look completely different and it will be built by those applying knowledge to the problems and constraints of the coming decades. Do you know of any studies that was done on the impact of manufacturing vs. distribution on an economy? For example – number of people will be emplyed if say toilet paper is completely manufactured in a city/town as opposed to having a distribution warehouse in the town? That would strongly support your theory. I am a Boost mobile consumer and Ive been having large quanities of data being used allegedly from my device, Ive been disputing this sin before March 2018 only to be told by customer support teams outside of the USA that it was infact me consuming the data. I disputed that fact by filing formal complaint with the FCC. Shannon fron Irvin Texas executive offices contacted me (Sprint) and launched some minor investigation ending with the same results. Im still unhappy with the outcome and did my own investigation. Hooked 2 Andoid Lg phones from boost to a computer a logcat to monitor usages not seen from the device its self. Google, my Boost , and Amazon consume data in the background without consent. Upon more research Google has been in several privacy law suits and is being investigated in Australia for consuming large quanties of data just like in my case. Boost the seller of said products ive purchased never advised me of these concerns and treats me terribly when im complaining my data is gone.Ive tried to revoke permissions maually yet they still run, Ive tried to root the devices permissions denied by lg google product manufactures imbedded as well in the devices. What can be done? Privacy and trust rights violated is that not correct? Microsoft Exchange And Android By Adrian Gates.